Roan High Bluff Overlook must be seen to be believed. Assuming there’s anything to see. The bluff is perched on an outcrop 6200 feet up in the Roan Highlands, one of the most storied locales in the Southern Appalachian Range. On a clear day the views go as far as your imagination can take them. Some days it’ll be fogged in completely, and on others you’ll find a cloud carpet covering every landmark for miles. I went up there yesterday planning to check out the view. Fate had other plans: I botched my route so badly (see my Comedy of Trail Errors below) that I figured I might as well make a map so others can have an easier go of it. 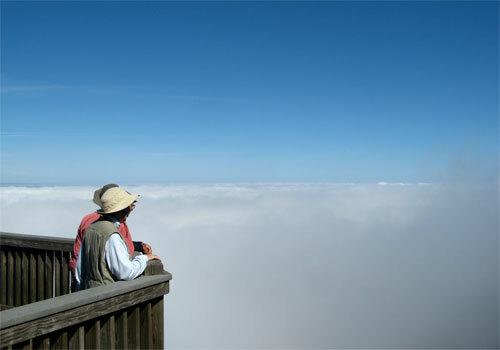 Shortest and easiest: Roan High Bluff is a half-mile down the Cloudland Trail from a gravel road in the Roan Highlands. If you’re here only for the view, just park near the trail on that gravel road (note there’s a $3 entrance fee). Nice easy hike: Park at the picnic area near the site of the old Cloudland Hotel. It has bathrooms and other amenities. Cloudland Trail goes 1.2 miles down to Roan High Bluff from there. Retrace your steps for an easy 2.5-mile hike (stop by the Rhododendron Garden during May-June bloom season). 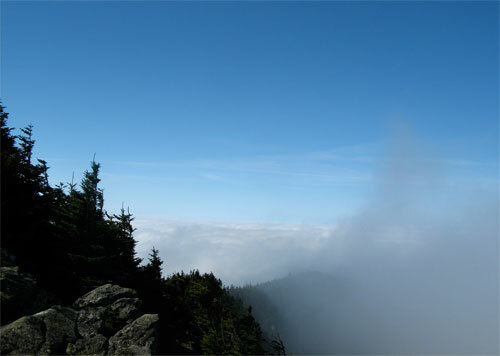 Moderate hike from Carvers Gap: Take the Appalachian Trail southbound from Carvers Gap for a little over two miles. 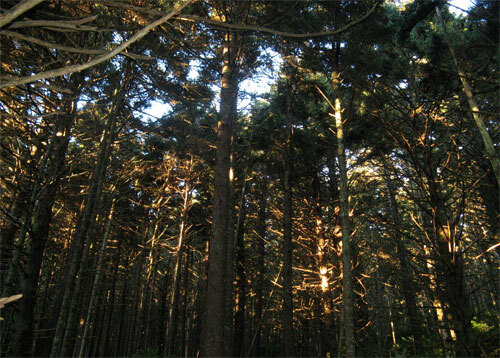 It’s all tree-covered, so banish thoughts of spectacular views along the way. When you round a bend looking out over a large, open grassy area, you’re at the old Cloudland Hotel site. Walk across the meadow till you see the parking lot. 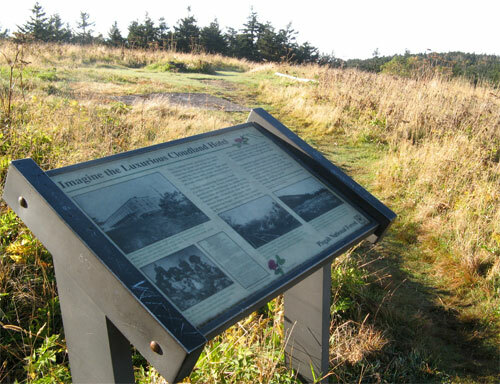 Walk to the far end of the parking lot and pick up the Cloudland Trail, then follow the signs to Roan High Bluff. Retrace your steps for a six-mile moderate hike. Google map to get you there. 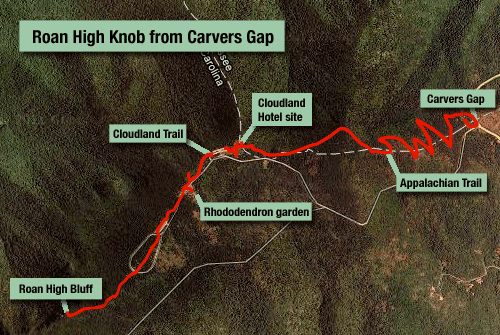 Click on Carvers Gap (far right) for driving directions. I planned to hike southbound on the Appalachian Trail out of Carver’s Gap, a well-known stop along the AT. From the Gap you can see a huge open hillside — a classic Southern Bald — which creates an expectation of gorgeous views. Of course I went the other way. I’d planned to hike from Carvers Gap to Roan High Bluff Overlook and soak in awesome vistas along the way. My research, however, failed to detect one critical fact: Except for the High Bluff, there are almost no vistas on this hike. I generally don’t mind tree tunnel hikes, except on days where I’ve gotten up at 4:30 a.m. and driven three hours to hit the trailhead at dawn to I can snap awesome shots of the early morning sun coloring the mountainsides. It was about 45ºF when I started out: my coldest start since about April. Fortunately it was all uphill for the first couple miles. Despite the welcome warmup, I couldn’t help wondering: Where are all the views I came all this way to see? Finally I arrived at the bend where a large vacant expanse of grass lies just beyond the trail. I wandered over to an interpretive panel explaining how there used to be a massive hotel right on top of this hill. It closed in 1914 and fell into disrepair. If I’d have walked about 12 more steps into the meadow, I’d have seen the parking lot leading to Cloudland Trail and Roan High Bluff. I knew I was looking for this Cloudland Trail but I figured it must be further down the AT. So the AT starts going downhill, and down I go for about a mile. The right time to consult one’s GPS unit — which notes all the pertinent landmarks — is before you’ve hiked downhill for a mile and 700 feet of elevation loss. Ideally you’d do the right thing at the right time on a hike like this. For me, it was more like the last resort. So anyway, when I finally realized I was more than a mile off-course, I turned back and start trudging back up the ridge. I was stopped to take a picture when I heard the damnedest racket from up the trail. It sounded like a radio. I looked up to see the guy slip. He got back up, righted his way-too-big backpack, and headed my way. I asked him if he was OK, he reassured me he was fine. As he passed I noticed the scraggly beard, stringy hair and gaunt countenance peculiar to two kinds of men: concentration camp survivors and thru-hikers past the 1800-mile mark. “You going to Georgia?” I asked. “Yeah,” he said. He left Katahdin in May, he told me. I figured as much. He set his radio to full-blast. Then he belted, “Well I stand up next to a mountain…” out into the forest. The intro to “Voodoo Chile” is one of my favorite musical moments. Hearing it right then was exactly what I needed to get back up the hill. That guy may have looked like hell, but he sounded like the happiest man for 500 miles at that moment. I was happy he wasn’t wearing earbuds. When I finally gazed out over Roan High Bluff, I’d been on the trail for three and a half hours. The sun is perpendicular to the ground — terrible for photography — and there was nothing to see but a carpet of white. “Well, this is par for the course,” I said aloud to the unfortunate gathering of folks admiring the view, such as it was. I regaled them with an accounting of my wrong turns and sundry woes. After I bid them adieu, I could practically feel the breeze from their sighs of relief that I was taking my complaints elsewhere. On the way home, I was chuckling at my ineptitude and smiling at the memory of The Voodoo Chile. It’s not really a hike if fate doesn’t slap you around a bit. And it’s refreshing to be reminded that nature always has the last laugh. Ha you definitely took the less scenic trail from Carver’s Gap. I went backpacking at Roan this summer, but on the other side. Just got the pics up. Roan Mountain sure brings back memories from my A.T. hike in ’03. It was rain and fog before we even got to the summit, and we couldn’t see a bloody thing on the top. I read a poster board in the rain, which described the hey-days of Roan Mountain. I hope to go back sometime in better weather. Tom, If you want the hike filled with views you should have hiked the other direction along the balds to Jane, Round and Grassy Ridge Balds and beyond. The other way is the “Dark” way. I am glad you got see Roan High Bluff, when it is clear, it is spectacular. Chris: I went there on your recommendation of Roan High Bluff …. saw it on Facebook and figured I might as well build a hike around it. My own fault for not reading other people’s trip write-ups. I sense a new style of story-telling, and it’s wonderful! I’d love to someday hike parts of the App Trail – never gamboled out that way before. Maybe with you someday. Keep keeping us entertained with your ongoing misadventures and wilderness malaprops!